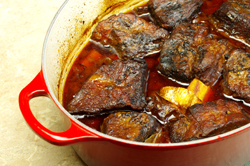 Short ribs are the go-to ingredients when I entertain in the winter. They’re relatively inexpensive but are enormously satisfying. If you make a little extra effort to refine the sauce, the ribs are worthy of the finest table. 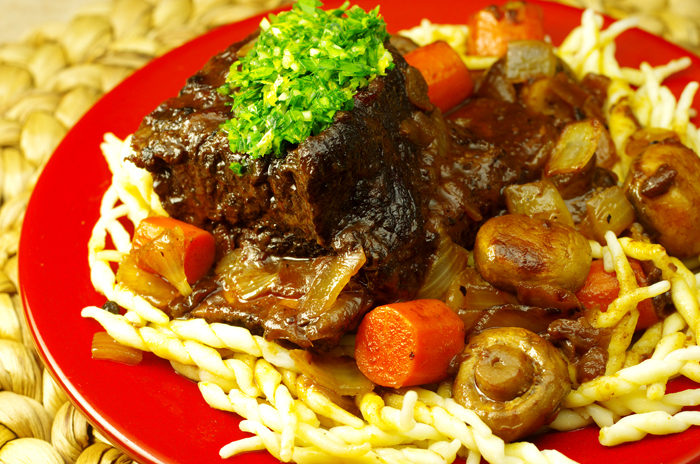 This recipe serves four but can easily be scaled up as needed, using two short ribs per person. The ribs are best and easiest to prepare a day or two in advance. Serve them on buttered egg noodles. In a Dutch oven or other heavy ovenproof pot, add enough oil to reach 1/4 inch/6 milliliters up the sides and heat over high heat. Put some flour on a plate. Dredge the short ribs in the flour, shaking off the excess. When the oil is hot, add the ribs and brown on all sides. You may need to do this in batches; you don’t want to crowd the pan, or the ribs won’t brown. Remove the ribs to a plate lined with paper towels/absorbent paper. 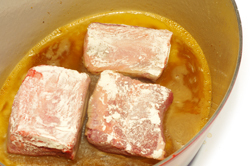 (This can be done a day before cooking the ribs; cover them and refrigerate until you’re ready to proceed). Preheat the oven to 250°F/120°C/gas 1/2. Wipe the pot clean and sauté half of the onions in a film of oil over medium heat until softened. (Refrigerate the remaining onions until needed.) Add a four-finger pinch of salt and stir. 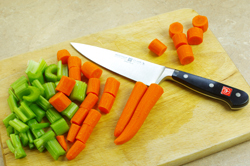 Add the half of the carrots (refrigerate the remaining carrots until needed) and the celery and cook for about 4 minutes longer. The longer you cook the vegetables, the deeper the flavor of the sauce will be. 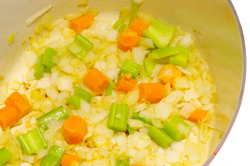 For intensely deep flavor, cook until the carrots and onions are browned. Add the tomato paste/purée and cook to heat it. Nestle the ribs in the pot. Add the wine (it should come three-fourths of the way up the ribs), garlic, ginger, and bay leaves. Season with a three-finger pinch of salt and add the honey and peppercorns. Bring to a simmer, cover the pot with a parchment round or a lid set ajar, and slide into the oven. Cook the ribs for 4 hours. Remove the pot from the oven and allow the ribs to cool, covered. When the ribs are cool enough to handle, put them on a plate, cover with plastic/cling film, and refrigerate. Strain the cooking liquid into a tall vessel (a 4-cup/960 milliliter glass measuring cup is best), cover, and refrigerate. 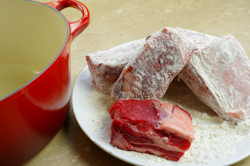 When the liquid has chilled, remove the congealed fat and discard. 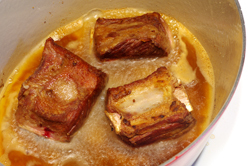 Melt the butter in your braising pot. 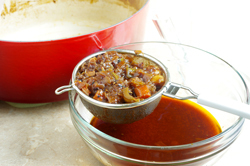 Add the reserved onions and carrots and sauté until softened, 3 to 4 minutes. Return the ribs to the pot and add the seared mushrooms. Add the reserved cooking liquid. Bring to a simmer, cover, and cook over medium-low heat until the carrots are tender and the ribs are heated through, about 15 minutes. Make the Gremolata: In a small bowl, stir the parsley, garlic, and lemon zest until evenly distributed. 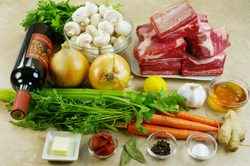 Serve the short ribs with the carrots, onions, mushrooms, and sauce. Garnish with the gremolata. Recipes from Ruhlman’s Twenty, The Ideas and Techniques That Will Make You a Better Cook by Michael Ruhlman. Published Chronicle Books, San Francisco, CA. Copyright 2011. Reprinted with permission of the publisher. All rights reserved.